IT was, in most fields in London higher, faster and stronger. But, in the boxing ring, it was definitely dirtier. Mark Anthony Barriga won his boxing match on Saturday neat and clear, but the referee stopped the tiny warrior in his sensational Olympic quest by helping push the gutsy Pinoy bullpup deeper down the floor. He did not take an actual hand in grappling and toppling Barriga, but referee Roland Labbe of Canada belied his foul intent by penalizing the big-hearted Pinoy kid after he was shoved down hard in the final minute of the third round. “The Kazakh was leaning on the back of Barriga’s head with all his weight when the referee shockingly penalized the Filipino supposedly for ducking,” reported Inquirer sports editor Ted Melendres. Majority of those who watched the bout on television in Manila were aghast at the anomaly. It was bad enough that the bigger Birzhan Zhakypov of Kazakhstan, a grizzled veteran, had manhandled the boyish Barriga in the second round, grabbing and shoving the tiny boxer like a toy teddy bear, with no visible concern on the part of the referee. Of course, it was all to Barrriga’s credit that, after falling behind in the first round, he still managed to move up and take the second round from the befuddled but bullying Kazakh through sharp, gutsy boxing. Barriga had indeed looked headed for his second win, after the previous mastery of a tall Italian foe, as he took the second round, 9-7; until the out-boxed Kazakh decided to resort to full-scale wrestling. No self-respecting expert or spectator would agree with the official verdict, rendered following a Philippine protest, that there had been nothing untoward behind Barriga’s 17-16 setback. A protest, lodged by Amateur Boxing of the Philippines executive director Ed Picson on the instruction of ABAP president Ricky Vargas, was summarily dismissed by the Association Internationale de Boxe (AIBA). 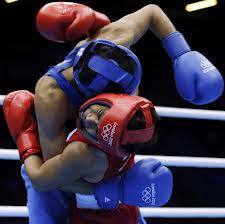 It was however noted that the ABAP complaint was not different from the one previously lodged by the US boxing team. In that case, involving an Indian and an American, the 13-11 result in favor of Krishan Vikas was overturned and awarded to Errol Spence, 15-13, after it was determined that the referee failed to give at least two warnings to the Indian (equal to four points). The ABAP could not help but cry discrimination. As things stand, it would appear that the AIBA, under a new Chinese president, has not honestly broken away from the dark ways of the previous regime, also known as the Dark Empire, under the leadership of the abominable Anwar Chowdry of Pakistan. The ABAP had all the right to protest and protect the interest of the young Barriga. But, at the same time, it should wake up to reality and take care not to heed the shallow suggestion for the undersized Barriga to try, train harder and proceed to the Rio de Janeiro Olympics in 2016. Sharp,gutsy and great as he is, Barriga should not be made to realize in another harsh, foul way that he was not honestly cut out for the tall Olympic task. His star is sure to shine in next year’s Myanmar Southeast Asian Games.